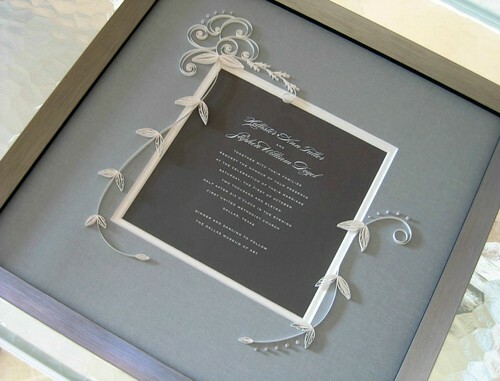 One of my favorite projects is to add quilling to a framed wedding invitation. Actually, the very reason I learned to quill is because I wanted to give one as a gift after being introduced to the idea via a magazine article. I've completed quite a few since then... this invitation was a commissioned gift for a Texas couple. 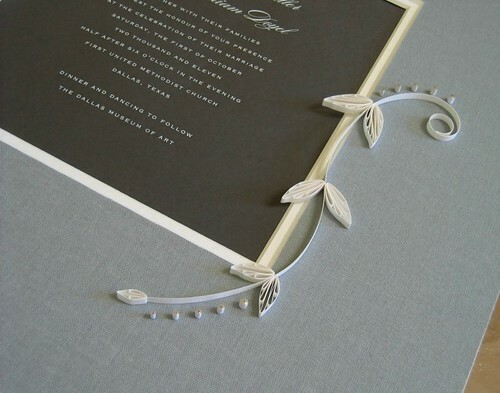 The understated charcoal invitation by Vera Wang featured raised white lettering. It called for a modern design, so I created a double scroll floral and leaf motif in white with touches of silver-edged white. 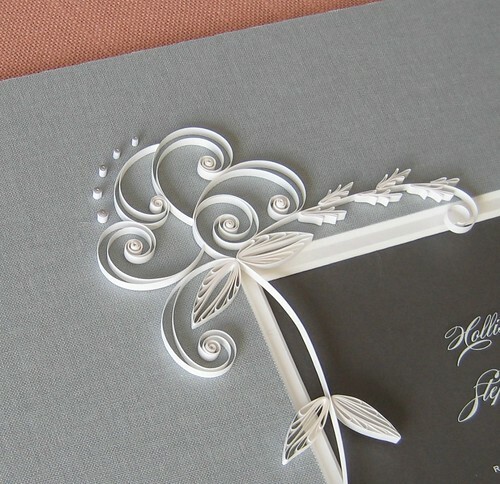 Gray fabric-like paper lined the invitation's inner envelope, and the client rightly suggested the mat board have a similar look. Luckily my local frame shop stocked a linen-covered one that was perfect. It's best to use acid-free paper and glue. Choose the highest quality materials available so the piece will look its best for many years... an archival mat and conservation or museum glass that will help protect the colors from fading. A framer can advise on the proper depth and use of spacers as the glass shouldn't press against the quilling. Keep in mind that any art piece is best hung in a location that doesn't receive direct sunlight. Another wedding item to which I added quilling recently is this doublette crepe paper hair accessory made by Jenny Jafek-Jones of The Crimson Poppy. I love the crystal center she used - so pretty. 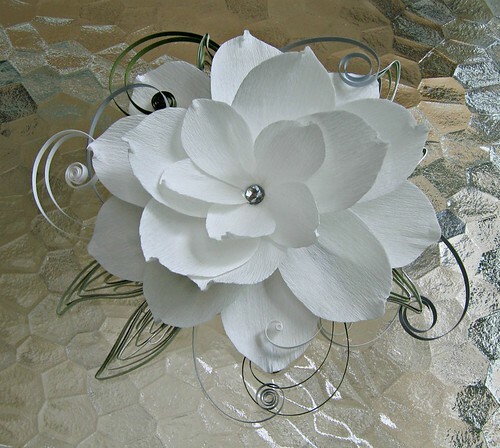 Quilled scrolls and leaves in green, silver, and white surround the flower. The bride lives in Hawaii... considering that location has more than its fair share of beautiful flowers, Jenny and I were delighted she considered wearing one of our paper blooms on her wedding day. Many thanks to Nole at Oh So Beautiful Paper for featuring this invitation. Such elegant scrolls Ann, I love how you use the tiny little tight coils in your work. The flower looks so beautiful. Congrats Ann on your beautiful quilled invite piece and flower. The invite colours are so sweet together...and yes, so modern, fresh and elegant!! Again, simply stunning, Ann! Wonderful! This is really lovely and elegant. I am so inspired by your work. Thanks for sharing and for this wonderful Blog. It is my favorite. Very elegant. The flower is beautiful too. You've outdone yourself again Ann - simply exquisite! Your work is absolutely beautiful. I showed your site to my daughter who quills. She thought it was lovely, as well. 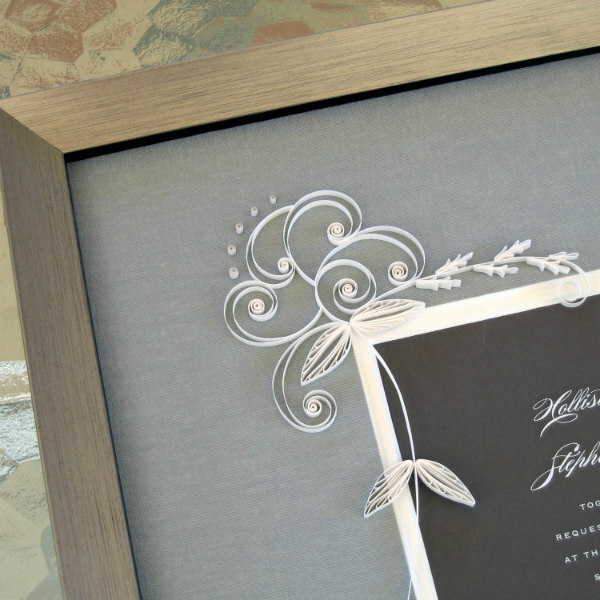 The framed wedding invitation is such a nice keepsake for the couple. Thanks everyone - I really appreciate your kind comments! this is so beautiful! i love the colors especially, very well coordinated. i hope the couple was suitably impressed! Really, Ann. Those are both absolutely stunning! I just love seeing the work you do! I just saw this site for the first time today...August 1, 2012. Your work is so beautiful Ann! Looking forward to getting my invitation to you and I appreciate that you are able to work it into your busy schedule. Thank you! Aw thanks Jane. I look forward to it too!